G4 is a wireless motion tracking system that delivers full 6DOF (6 Degree-Of-Freedom) tracking, providing both position and orientation without hybrid technologies. Allowing the user complete freedom of movement, the entire system can be set up in minutes. As with all Polhemus tracking systems, G4 utilizes our proprietary AC electromagnetic technology. This means G4 tracks through most walls, as no line-of-sight is required for continuous tracking. G4 works with our Standard Sensors, and is fully compatible with Micro Sensors. Tetherless tracking utilizes a wireless data transmitting system. Position and Orientation is sent wirelessly to the PC via RF links. Our proprietary technology tracks through walls—and people. 10+ Hours of Battery Life Track in the field or in the lab all day, without having to start and stop because of battery life. The long-life battery is easily recharged via the wall charger. The G4 system is compact and portable, and the system electronics unit (hub) can be belt worn. This allows you to change or move your tracking environment quickly. The G4 system has auto tracking capability, meaning G4 will re-acquire the signal as a tracked subject walks back into the field of tracking range. 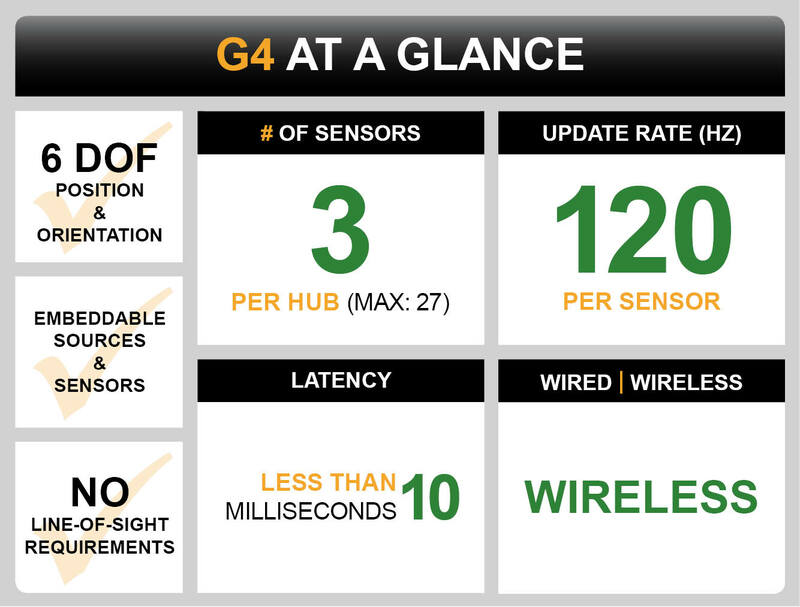 The standard G4 system includes one hub, one source and one sensor. One of the most impressive features of G4 is the product can be scaled up to continue to meet your needs as they evolve. As your applications change or expand, you can add components to increase G4's capabilities. If you need to increase the number of people or objects being tracked, you can add up to nine hubs; increase the field of range by adding up to eight sources. Review technical specifications of all Polhemus trackers: Polhemus Tracking Performance Chart. Is G4 the right tracker for you?